The event will showcase digital printing technology, inks, coatings and varnishes, offset printing technology and machinery, packaging machinery and materials, plates and platemaking equipment, pressroom handling equipment, print finishing and binding equipment, printing equipment, machinery and materials, among others. Ipama organises Print Pack India, the third largest exhibition of its kind in the world and the biggest in India. “The upcoming edition of Print Pack Arabia will take advantage of the thriving packaging market in the Middle East and North Africa (Mena), which is set to grow at a higher rate than the global market, underscoring the pre-eminence of the regional market and the significance it holds for equipment makers and dealers,” said Saif Mohammed Al Midfa, CEO, Expo Centre Sharjah (ECS). An agreement was signed by Midfa and KS Khurana, president, Ipama, in the presence of CP Paul, general secretary, Ipama; P Ravi, director, marketing, ECS, and Naveen Fernandes, group exhibition manager, B2B and ECS. According to a recent study, while the packaging market in Mena is set to grow at a CAGR of 5 per cent from 2014 to 2019, the global market is forecast to grow at just over 4 per cent during the same period. The packaging market in Mena is currently valued at $41.1 billion and is forecast to grow to $52.4 billion by 2019, according to the study. Globally, the packaging industry will generate $975 billion in sales by 2018, and 60 per cent of that will be created in the food industry. “I am extremely happy to continue our partnership with Ipama. We drew a lot of success from Ipama in successfully launching Print Pack Arabia in 2014. I am sure together we can present a bigger event for the regional printing and packaging industry,” added Al Midfa. Despite being the launch edition, the first Print Pack Arabia in 2014 featured close to 100 exhibitors in 8,000 sq m of exhibition space and attracted nearly 4,250 visitors from 77 countries. 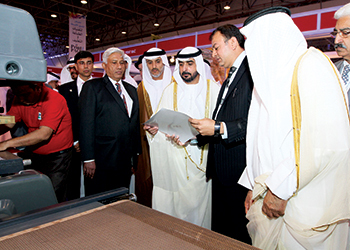 Exhibitors at Print Pack Arabia 2014 were quite satisfied given that all of them managed to sell their machinery which they displayed during the show, a unique feat for a new show. “With the UAE packaging industry relying heavily on exporting to other regional markets, which account for more than half of the trade volume, Print Pack Arabia will also offer Indian makers of the latest machinery, equipment and allied products an opportunity to explore the GCC and Middle Eastern markets,” said Paul. “Indian machinery manufacturers offer a good product at reasonable rates. This coupled with immediate deliveries and service reliability make them a great option for Middle East printers” he added. Printing revenue in the region too is forecast to grow at over 7 per cent to reach $26 billion by 2018. Globally, the printing industry is forecast to reach $980 billion by 2018, driven mainly by growth in packaging and labels.